Hello loyal and faithful readers. I trust that my inactive weekend (at least on the blog front), hasn’t left you too thirsty for a drink of my knowledge in an otherwise dry desert of sports news and musings. Not to worry, friends. I have finally gotten around to doing my final divisional fantasy preview: The National League Western Division. Without further delay, let’s get to the both the nitty and the gritty of it all. The Giants are still head and shoulders above every other team in this division. They proved it last year when they beat the Texas Rangers in the World Series. This season promises a good chance at a repeat. It’s all about pitching for Giants, but their offense contains a couple of meaningful contributors as well. Buster Posey was the star of the 2nd half show last season, and he’s looking for an encore in 2011. Aubrey Huff will also contribute wherever he ends up playing, and Pablo Sandoval isn’t too far removed from hitting .330 with 25 home runs in 2009. Sandoval has lost about 40 lbs this off season, and is looking to get back to form. Even Cody Ross could put up some decent numbers once he comes off of the DL. The rest of the team won’t do much for fantasy baseball owners, but will provide Giants fans with a winner. And now for the meat and potatoes. 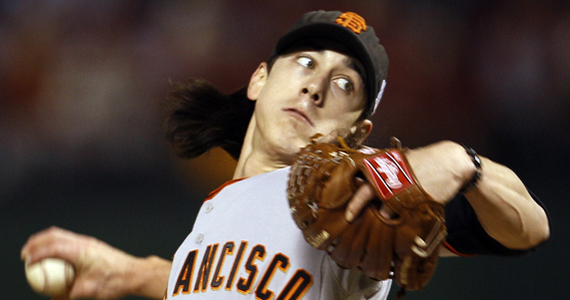 Lincecum, Cain, Sanchez and Bumgarner are among the top young arms in baseball, and this rotation’s potential rivals even that of the great Philadelphia Phillies (sorry Roy, Roy and Cliff… you’re old). In this rotation the Giants have 4 guys who could win 15-20 games and strike out 150 to 200 people. That is no joke. Not even Barry Zito can bring this rotation down… too much. The bullpen contains one of the best (and most sea-worthy) closers in the game in Brian Wilson, and the set up corps are solid as well. Barring injury, pitching coach Dave “Rags” Righetti’s job should be pretty easy this season. My Prediction? 94 wins, division champeeeens. Fantasy Notables: Buster Posey, Aubrey Huff, Pablo Sandoval, Cody Ross, Tim Lincecum, Matt Cain, Johnathan Sanchez, Madison Bumgarner and Brian Wilson. Fantasy Sleeper: Brandon Belt. If you don’t know, now you know. He’s be 2011’s possible Buster Posey. Fantasy Poison: Do not draft Barry Zito, and do not pick him up if he has 4 good starts in April. He was never that good, and he’ll never be again. The Dodgers took a step back in 2010, Joe Torre’s final year as a Major League manager. They finished third and missed the playoffs after making it to the NLCS in 2009. I think they’ll come short of those lofty accomplishments, but they should be a solid team in 2011 and could surprise the mighty Giants. On offense, the Dodgers fair slightly better than their division rivals. Matt Kemp and Andre “The Frenchman” Eithier are among the more talented players in the league, but both are still looking for that truly breakout season that has eluded them as of yet. Both men are capable of 30 home run seasons when healthy, and Kemp could add 30 steals to that number as well. Left field is interesting, with Marcus Thames and “Gabby” Jay Gibbons sharing the load. The infield is somewhat troubling, with James Loney getting worse by the year, Casey Blake injured at 3B, and perennially disabled Rafael Furcal at SS. The Addition of Juan Uribe and his 24 home runs at 2B should inject another solid bat into the lineup, and take away from the Giants offense as well. The Dodgers already had a good start to their rotation with Chad Billingsley and lefty phenom Clayton Kershaw at the top. Those two are up there with Cain and Lincecum as the better 1, 2 combos in the league. The Dodgers brought back underrated hurler Hiroki Kuroda, and added solid lefty Ted Lilly to the mix through free agency. Even the 5th starter, John Garland, is coming off of a very solid season for the Padres. This is another case of the Dodgers adding to their own team while taking away from a rival. At closer, the Dodgers have Jonathan Broxton, who looms large as an intimidating figure in the bullpen (and at the lunch buffet). The near 300 pounder lost the closers job toward the end of last season, but should come back strong in 2011. My Prediction… 87 Wins for new Manager, and my hero, Don Mattingly. Fantasy Notables: Matt Kemp, Andre Ethier, Juan Uribe, Rafael Furcal (if he could ever stay healthy) Clayton Kershaw, Chad Billingsley, Ted Lilly, Hiroki Kuroda and Jonathan Broxton. Fantasy Sleeper: Hong-Chih Kuo. Broxton lost his job last year. Who is to say he won’t again? Kuo’s 1.20 ERA last season might make this an easy choice if the time arrives. Fantasy Poison: James Loney. His SLG has been under .400 the last two seasons. This is unheard of and unacceptable for 1B. At 27, he doesn’t show signs of breaking out, only of more erosion. The Rockies are a young team (mostly), and will be tough competitors for their division rivals this season. Unfortunately, they are missing one or two pieces to the puzzle. This is something that could be remedied at the all-star break, but it must be done before they can truly contend. That being said, the Rockies have two of the most exciting players in all of baseball in their lineup. OF Carlos Gonzalez is capable of 40/40 numbers, while SS Troy Tulowitzki will some day win an MVP. Ian Stewart (3B) and Dexter Fowler (CF) are interesting names as well. Heralded as top prospects, they were finally given the reigns at their respective positions last season and responded pretty well. Fowler led the league in triples, and Stewart mashed 18 homers last season despite missing some time with injury. Ubaldo Jimenez put it all together last season (at least in the first half). He won 19 games, struck out 214 men and even pitched the first no-hitter in Rockies history. After him, the Rockies have lefty Jorge De La Rosa, who pitched well but missed a lot of time with injury. The new kid on the block is Jhoulys Chacin, and he’s got what it takes to keep “hanging tough” in the NL West (a-thank you). In all seriousness, this kid could be the key to the rotation this season. He was just 22 last season, but won 9 games with a 3.28 ERA and struck out more than 1 man per inning. Huston Street should hold his own at closer, unless the Rockies decide to trade him. My Prediction? 85 wins… a solid season. Fantasy Notables: Troy Tulowitzki, Ian Stewart, Carlos Gonzalez, Dexter Fowler (if he can add just a little power), Ubaldo Jimenez, Jorge De La Rosa, Jhoulys Chacin, Jason Hammell, Huston Street. Fantasy Sleeper: Chris Iannetta is the starting catcher. No more platoons for him. If he can take advantage of this, he could hit 20-25 home runs… premium statistics for a weak position. Fantasy Poison: Todd Helton. He’s 37 years old and coming off of a terrible, injury-plagued season. Fortunately for him, the even older Jason Giambi is his backup… Anyway, stay away from the Highway to Helton. The D-Backs were great competitors, seemingly on the rise, until two seasons ago. For some reason, it all fell apart. This season seems to be another re-building year for the snakes, as they try to fill the void left by Dan Haren’s departure last season, and Mark Reynold’s exit via trade this past off-season. The D-Bags (ahem… Backs), feature one of the most exciting young hitters in the game, former #1 overall pick Justin Upton. Like his brother, BJ, before him, Upton rose through the ranks with heralded power and speed potential. Hopefully for the Diamondbacks, last year’s down season isn’t a sign of a career collapse like BJ Upton has experienced the last couple of seasons. At just 23, Justin is looking to bounce back and become an elite player. Fellow Outfielder Chris Young had a great bounce-back of his own last season and could be a threat for 30/30 type numbers. catcher Miguel Montero needs only to stay healthy, and he could be one of the better hitting catchers in the league. The rest of the offense is filled with question marks. Can Stephen Drew climb back to his 2008 numbers? Can Melvin Mora and Geoff Blum fill Mark Reynolds shoes? Was Kelly Johnson’s breakout season simply a fluke? Who the hell is Juan Miranda? It could be a long season in the desert. The pitching picture isn’t much clearer for the Rattlers… Former Yankees prospect Ian Kennedy will be their opening day starter… It’s nice to know he can pitch well now that he’s out from under the pressure of playing in the best sports city in the world. I wish him well, I promise. The real money maker in this rotation is young hurler Daniel Hudson. Hudson, a righty acquired in the Edwin Jackson trade last season, burst onto the scene in the second half last season. He was practically un-hittable in his 11 starts with the Serpents (1.69 ERA, 0.84 WHIP and a 7-1 record), and Diamondbacks fans hope that momentum carries him into this season as well. The addition of closer J.J. Putz should solidify the bullpen, which is otherwise unimpressive. My Prediction? 76 wins… and a step toward rebuilding. Fantasy Sleeper: Russell Branyan. Juan Miranda has never proven anything at the Major League level… Russell Branyan’s nickname is “The Muscle.” 450 foot home runs will follow. Fantasy Poison: Joe Saunders. In Anaheim, he only won because the offense helped him do so. He won’t have that in Arizona. He will, however, have 15 losses. The Padres won 92 games last year… somehow. It will not happen again in 2011. In my opinion, the players they lost this off season took with them 20 team wins. It’s gonna be a long, yet sunny season in San Diego. Petco Park is one of the worst hitter’s parks in baseball. This does not bode well for an offense that lost it’s only real offensive threat when Adrian Gonzalez was traded to the Red Sox in December. There is simply no one else on this roster who can even approach A-Gon’s numbers, especially his replacement, Brad Hawpe. A healthy Ryan Ludwick, could help ease the pain of the Gonzalez loss, but it won’t be enough. Chase Headley, another candidate to step into the heart of the order, came to the league with much ballyhoo a couple of seasons back, but he hasn’t come close to his rumored potential. Runs will be hard to come by in San Diego this season. Pitching wise, the Padres are solid, especially since they will play 81 games at Petco. Matt Latos should be a stud this season, especially now that his innings limit will be lifted. 20 wins and 200 Ks might sound crazy, but they are quite attainable goals for this youngster. Clayton Richard seemed to come pretty much out of nowhere last year, as did Tim Stauffer, but they had been thought of as solid prospects before their breakouts. Stauffer won’t have a 1.85 ERA this year, but he could prove himself a solid Major Leaguer. Unfortunately for the Padres, Dustin Moseley and Aaron Harang (“The Harangutan”), are among the favorites for the remaining roster spots, which is a scary thought. A thinner Heath Bell returns to the closer position in 2011, at least until he is also traded in July. My Prediction? 72 wins… no surviving until the last day this year. Stay Classy, San Diego! Fantasy Notables: Ryan Ludwick, Matt Latos, Clayton Richard, Tim Stauffer, Heath Bell. Fantasy Sleeper: Will Venable. Someone has to step up to help this offense this season. Why not a Princeton grad? This kid has the skills to hit 20 home runs and steal 30 bases, but it will be tough in Petco Park. Fantasy Poison: A couple of years ago, the “O-Dog”, Orlando Hudson and Jason Bartlet were popular pickups at traditionally weak middle infield positions. Hopefully, they don’t remain as such. They are terrible. There you have it, readers… I hope you have learned a lot from this series of posts. I know i sure have (mostly about how smart I am). Thank you.